Welcome to the twenty third seasonal bonus episode of the podcast, this week we are taking a look at the Sanctuary episode “Penance” which features Michael Shanks as the major guest star and a co-starring roles for Aleks Paunovic as “The Duke”. In this episode the Sanctuary team are meeting up with a courier who is transporting a very dangerous abnormal but they are intercepted by a criminal gang led by “the duke” who has laid claim to the abnormal. During the fire fight the team are split up and the courier Jimmy played by Michael Shanks escapes with Kate who is shot as they flee the scene in a car. The two hole up in an abandoned hotel with no communications while Helen and the rest search for them and deal with the Duke as he too looks for his prize. 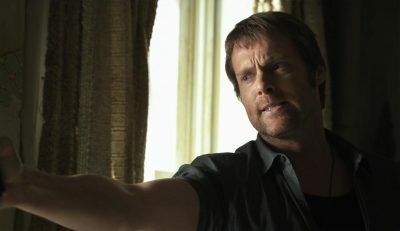 Penance is the ninth episode of the second season of Sanctuary and as you would expect when you get Michael Shanks to guest star he is going to take center stage. The episode starts off action orientated but quickly evolves into a character piece with a lot of the scenes focusing on Jimmy and Kate as they deal with her injury and discover their shared history which leads to a rather serious standoff thankfully defused by the Big guy played by Christopher Heyerdahl under a lot of prosthetics. Aleks plays the bad guy to perfection and while the joke about the golf club was probably in bad taste it was funny and his choice of artwork was an added detail to the character and story that was noticed. Overall Penance is an entertaining episode of Sanctuary which made good use of Michael and Aleks as well as mixing location shooting and the heavy green screen sets the show was known for. Our thanks to Brad for joining Mike on the show this week as Alan was busy and next week we are going to be look at the series opener of Dark Matter for another seasonal bonus show, join us for that and if you want to leave some feedback we would love to receive it.